By Paul Specht on Wednesday, March 20th, 2019 at 1:42 p.m.
On March 14, Tillis voted to support President Donald Trump’s national emergency declarationto circumvent Congress and fund a wall on the southern border. Tillis’ vote received attention across the country, because it came less than a month after he wrote an op-ed in the Washington Post that criticized Trump’s decision. On Feb. 25, the Post published Tillis’ letter: "I support Trump’s vision on border security. But I would vote against the emergency." 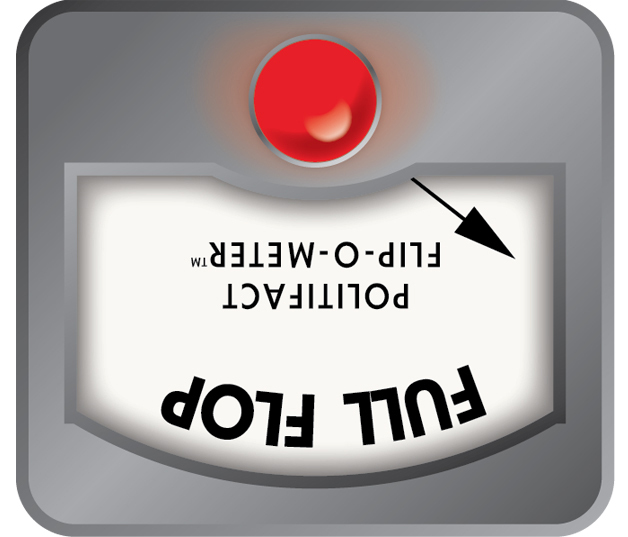 A Washington Post reporter called Tillis’ vote a "remarkable flip-flop." WRAL’s editorial staff referred to it as a "flip-flop for the ages." The Fayetteville Observer’s editorial writers said it was an "Olympic gold flip-flop." In a fundraising email, the North Carolina Democratic Party said Tillis "says one thing, then does another." "But I am not. I am a member of the Senate, and I have grave concerns when our institution looks the other way at the expense of weakening Congress’s power," he wrote in the Feb. 25 letter. "Those on the left and the right who are making Trump’s emergency declaration a simple political litmus test of whether one supports or opposes the president and his policies are missing the mark," Tillis wrote. In a press release after the vote on March 14, Tillis said his concerns were "never about what President Trump is trying to accomplish but rather with setting a precedent that a future Democratic president would exploit to bypass Congress to implement policies well outside the mainstream." "My main concern with this executive action is future potential abuses. I have a concern with the executive action that the president took, the emergency order. That’s why I voiced it," Tillis said, adding: "But I’m sympathetic to what he was trying to do … and I thought we could view this as an opportunity to where maybe we could have a discussion about the National Emergencies Act and potentially make a real difference here." "That this president is prepared to transfer power back to the Article 1 branch by his statements either publicly or through his administration is extraordinary," Tillis said. "Although Trump certainly has legitimate grievances over congressional Democrats’ obstruction of border-security funding, his national emergency declaration on Feb. 15 was not the right answer," Tillis wrote. "There is no intellectual honesty in now turning around and arguing that there’s an imaginary asterisk attached to executive overreach — that it’s acceptable for my party but not thy party," Tillis wrote. 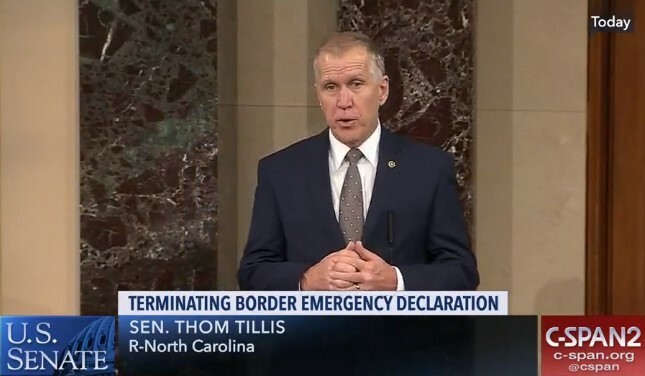 Published: Wednesday, March 20th, 2019 at 1:42 p.m.
Press release by Sen. Thom Tillis, Republican from North Carolina, "Tillis Statement on National Emergency Vote," published March 14, 2019. Proclamation by President Donald Trump, "Presidential Proclamation on Declaring a National Emergency Concerning the Southern Border of the United States," issued Feb. 15, 2019. Video on c-span.org, "Senators Lee, Tillis and Schumer on Terminating Border Emergency Declaration," posted March 14, 2019. An op-ed by Sen. Thom Tillis in the Washington Post, "I support Trump’s vision on border security. But I would vote against the emergency," published Feb. 25, 2019. Stories by the News & Observer, "Tillis reverses course, votes to support Trump on national emergency declaration," published March 14, 2019; "Tillis plans to vote against national emergency. Has he opened path for a challenger?" published March 5, 2019. 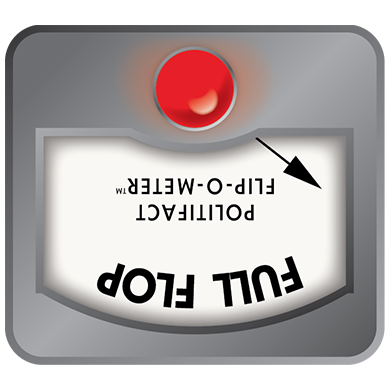 Story by the Washington Post, "Thom Tillis’s remarkable flip-flop on Trump’s national emergency and 4 others who also backed off," published March 14, 2019. Editorial by WRAL, "Sen. Tillis delivers flip-flops for the ages," published March 15, 2019. Editorial by the Fayetteville Observer, "Our View: Tillis performs an Olympic gold flip-flop; Bragg security passes a test," published March 15, 2019. A fundraising email from the North Carolina Democratic Party, "Tillis' Broken Promise," sent March 15, 2019. Press release by Sen. Mike Lee, Republican from Utah, "Sen. Lee Introduces ARTICLE ONE Act to Reclaim Congressional Power," posted March 12, 2019.